Here’s a list of 5 book search extensions for Google Chrome which can help you find books online. Extensions that I tested will help out by giving you access to tools needed to locate book info and where to get them online from within Chrome. If you’re a book person and you’re a Chrome user, these extensions might interest you. Let’s have a look at what exactly is that’s available and how exactly it is that these extensions work. Book Depository Search is a book search extension for Chrome which adds a right click context menu option that lets you quickly search author names and book titles on the Book Depository website. Extension works the same way that Google search option does. Whenever you come across something interesting, make a selection, right click, select the “Search Book Depository” option and you’ll be taken to results on the Book Depository website. Libre-ry Book Search is an extension that integrates a search tool for Library Genesis, which is a public library that offers over 30 million ebooks as free download. Search tool can be accessed by left clicking on the top right corner icon. 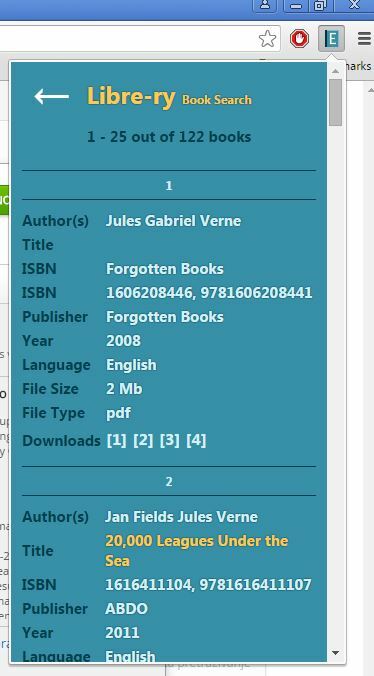 From there you’ll be able to perform a search by typing in either the book title, author name or the ISBN number of the book. Results are shown in the same drop down window. Links for download are near the bottom of each result. Several different book formats are supported, PDF, CHM, EPUB, etc. Also, have a look at 10 Best Free Book Review Websites. Goodreads Right Click is similar to Book Depository Search, as you can probably guess from the extension name what it is that it does. This book search extension also adds a right click context menu option, only its for Goodreads, the very popular social website for book lovers. Website also has a very large database of books whose info you can look up more easily, from the right click context menu, using this extension. Open Library Book Search is an app that functions pretty similarly to how Libre-ry Book Search does. It will let you look up books in the OpenLibrary online catalog of books that’s available for free. Entire interface loads up in a new tab, after clicking on the app icon. From there simple and advanced searches are possible. 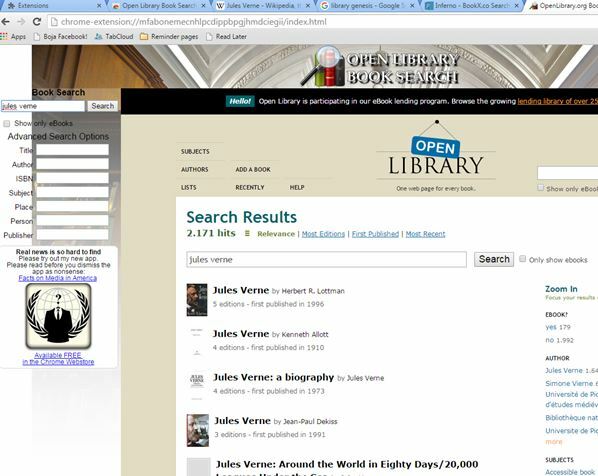 Get Open Library Book Search. Also, have a look at Online Book Catalog To Read, Download EBooks: Open Library. 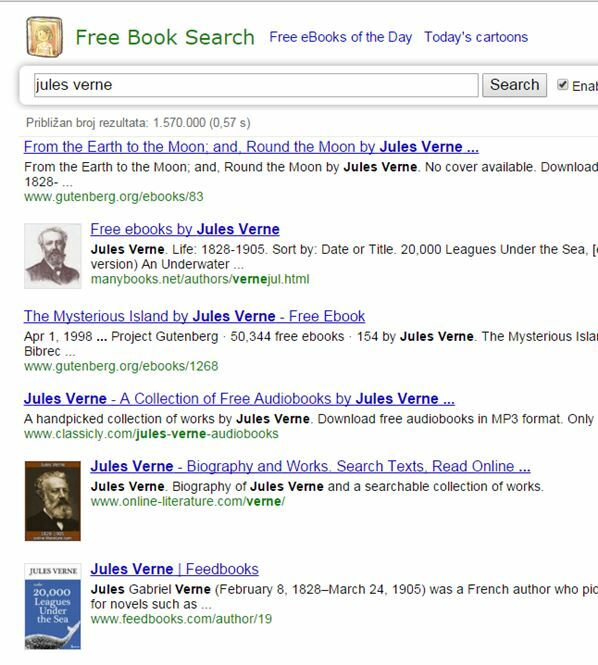 Free Book Search combines several different sources of free books and then lets you search for books on all of them at once. Available online library portals include sites like Project Gutenberg, Manybooks, Wikisource and many more. Each time that you need to make a search just launch the app and it will load up in a new tab. All 5 of the book search extensions for Chrome from the list above are great at what they do. I like Libre-ry Book Search because it integrates more fully with Chrome. After that I suggest you try Free Book Search, mainly because it covers lots of different services. Leave a comment down below and let me know what you think.